By Martin E. Tremor Jr.
On Sunday, September 5th, eleven eager shelling enthusiasts boarded two small planes in Ft. Lauderdale, Florida. We were on our way to the Bahamian Island of Eleuthera for a six-day shelling trip sponsored by the Astronaut Trail Shell Club. Our group consisted of Jim and Bobbi Cordy of Merritt Island, Conrad Forler and myself from the St. Petersburg Shell Club, Brian and Celeste McKissick from Ohio, James and Janene Brunson from Ohio, and Roger and Mary Jo Bunnell from the Astronaut Trail Shell Club and their guest Merilyn from Virginia. As the coastline of Florida faded away behind us, all eyes were on the horizon. Below us was the incredibly deep blue of the Gulf Stream. It wasnt long before the Bahamian Islands of Bimini, Andros and Nassau appeared on the horizon, and then, just one hour after leaving Ft. Lauderdale, the beautiful island of Eleuthera appeared in the distance. A long and narrow thread of an island dividing the usually tranquil Exuma Sound from the open Atlantic Ocean, Eleuthera is actually slightly more then 100 miles long and runs in a northwest to southeast direction. Our concern on this trip was the southeastern end of the island from Governors Harbor to Cape Eleuthera - a distance of about 50 miles. By no stretch of imagination could this trip be called a "world class beach resort" kind of vacation. It was, just as intended, a shelling trip plain and simple. Our accommodations were more then adequate and consisted of three small two-bedroom cottages, with each cottage sleeping four. Amenities were air-conditioned bedrooms, a bathroom and a sparsely furnished kitchen that did have a microwave. Each cottage came with an older car for four people - just perfect for our needs. The one thing that there was always plenty of was clean linen. Ethel, the owner of our home away from home, was a lovely woman and was always available for anything we might need. Throughout the trip we fondly referred to our happy little accommodations as the "Tarpum Bay Hilton." No waterfront restaurant here, but there was an ice cream "shop?" just around the corner and a bakery just up the hill. After clearing customs in Rock Sound, we found our cars waiting for us just outside the airport. Ethel had them brought there to await our arrival. We jumped onto the "Eleuthera Freeway," that super narrow, and I might add somewhat rough, ribbon of asphalt also known as the Queens Highway that runs the entire length of the Island. A short drive of about 20 minutes, and there we were on the shore of Tarpum Bay. All those dreams of the weeks and months before were now a reality. Almost everyone wanted a bit of lunch before plunging into Tarpum Bay - their choice but not mine. I donned a mask and snorkel just as fast as I possibly could. I just knew that somewhere under the surface, under some unsuspecting rock, some shell somewhere was waiting just for me. The water of Tarpum Bay was warm, calm and clear. There were conch pens scattered around the area where the fishermen would keep their catch until they could be used. This method of keeping the animals alive until needed was probably necessitated by the lack of good refrigeration on the island. The members of our group from Ohio (Brian, Celeste, Jim and Janene) were fascinated by the beautiful Queen Conchs (Strombus gigas) in the pens. Scattered around the pens were many others that had already been cleaned. Some of the shells were really quite nice. However, they all had the usual hole in the apex - the result of cracking the shell to remove the animal for food. Although useless as specimen shells, these were nice enough to make very attractive display shells to take home to friends and family. For those of us seeking specimen shells, there were Atlantic Marginellas (Prunum apicinum), Netted Olives (Oliva reticularis) and beautiful True Tulip Shells (Fasciolaria tulipa) - all for the taking. In some of the piles of dead conchs, we found live Apple Murex (Chicoreus pomum). On the rocks, down along the cemetery just south of town, we found live Lace Murex (Chicoreus florifer) and under the rocks, the Chestnut Latirus (Leucozonia nassa). Attached to the rocks were many Atlantic Pearl Oysters (Pinctada imbricata). Although shelling in Tarpum Bay was not fantastic, it was a beautiful spot and right in front of our accommodations to boot. It was the perfect place to spend a few hours working on our snorkeling skills so as to be ready for some serious shelling in the morning. Before the afternoon was over we had added a few Milk Moon Snails (Polinices lacteus) and small Gaudy Naticas (Naticarius canrena) to our list of species found. The latter two were crabbed but good representations of the species. A walk down to the concrete jetty with a flashlight that evening was successful in producing some decent West Indian Top Shells (Cittarium pica). On this trip, Jim and Bobbi Cordy were our official representatives of the Astronaut Trail Shell Club and therefore officially recognized as our fearless leaders for the next four days. The following morning Jim led us about 40 miles north to Governors Harbor. On this particular morning the commuter traffic on the "Eleuthera Freeway" was especially heavy. We must have seen at least three cars during the drive. Looks like we will have to get an earlier start to avoid such a rush in the future. Suddenly Jim came to an abrupt stop. "This is where we turn," he said. As we made our turn onto the narrow sand and coral road, we could see ahead a huge dump truck coming towards us in a cloud of dust. Being no place to pass, we backed up on to the main road again. Lucky the other two cars in our caravan had not made the turn and were still on the main road. As the one truck passed us, the driver told us another truck was right behind him and that we should wait. Sure enough, another truck appeared in a cloud of dust and then the road was clear, we hoped. The road started out rough and rapidly went down hill from there - dry potholes, then potholes filled with water, then ruts and then gullies. Our fearless leader pushed on. Suddenly we were in a massive garbage dump. Pushing further, we found that the dump was smoldering on both sides of the road. Good grief, the place looked like a war zone. Where in the world was Jim taking us? One should trust his leader. Jim knew exactly where he was going. Abruptly we came out of the smoke and haze of the fires, and there, right in front of us was a most beautiful tropical sandy beach. Gently curving with a point to the left and a lovely island just off shore - paradise found. We donned our gear and waded out into the shallow water that was warm and crystal clear. Then it was heads down and bottoms up as eleven people went on their way. I immediately came upon a Milk Conch (Strombus costatus) and it wasnt long before we realized that these lovely conchs were everywhere - literally by the hundreds. They were all small shells (88-110 mm.) but fully mature. I suspect that this part of Eleuthera has a dwarf population. I quickly collected six, and then and for the next thirty minutes, constantly exchanged those for better specimens. There were so many that this soon became boring and it was time to look for something else. I did not have to look long. Half buried in the sand I spotted the unmistakable shape of a West Indian Chank (Turbinella angulata). So far this had been mostly sand bottom, but before long, the bottom changed to sand mixed with rocks and beds of small mussels. On these mussel beds Bobbi was finding found lovely Chicoreus florifer. They were not easy to spot, but Bobbi showed me the trick of what to look for and soon I too found them. Again there were enough that one could be selective as to which ones to keep and what to release. In this same environment we found quite large Star Shells (Astralium phoebium), they too blending in well with their surroundings making them difficult to spot. In some of the sand patches were long wispy growths that looked like long feathers. Growing on these were some really nice Atlantic Wing Shells (Pteria colymbus), and on the rocks were Atlantic Pearl Oysters (Pinctata imbricata). Jim and Bobbi both found Atlantic Carrier Shells (Xenophora conchyliophora). Other finds included some dead but paired bivalves all complete with hinges; Listers Tellin (Tellinella listeri), the American Tiger Lucina (Codakia orbicuaris), beautifully colored Egg Cockles (Laevicardium serratum), the Faust Tellin (Arcopagia fausta) and the Pennsylvania Lucina (Linga pensylvanica). While most of us worked along the beach to the north, Conrad snorkeled a little south and then across the channel to the offshore island. He reported a beautiful reef off the far side of the island that was just loaded with angelfish, tangs and butterfly fish. He returned with a few very large Cittarium pica that he retrieved from the deep coral crevices as well as some Short Coral Shells (Coralliophila abbreviata) that he found at the base of the sea fans. This had been an absolutely fabulous morning, but after some lunch under the shade of the shoreline casaurina trees, it was time to move on to where Jim promised us some Dunns Murex (Chicoreus dunni). Between Governors Harbor and Palmetto Point, right along the road, lies a quite large saltwater pond. It is in this pond that the "endemic" Chicoreus dunni is found. Access is over a very rocky shore. The water is clear, very shallow, quite silty on the bottom and not very pretty. The water was very warm and the algae bloom was profuse - certainly not a very likely looking spot. Jim was confident that we would find the little black Murex, so in we went. One had to quickly move on after entering the water as it soon silted up making vision impossible. As long as we moved ahead, everything was fine. And there they were, plentiful to be sure, those lovely little Murex. Most were very small, but careful searching produced some larger ones (about 35-40 mm.). We also found tiny little Prunum pellucidum in the pond. To top it all off we found small little black True Tulip Shells (Fasciolaria tulipa) and small very dark brown Bubble Shells (Bulla striata) mixed in the clumps of algae, and Cayenne Keyhole Limpets (Diodora cayenensis) clinging to the blades of grass. It was a strange place at best, so we did not stay long - just long enough to obtain representative specimens of each species. To start the morning, Jim walked us down to the tip of Powell Point. Pretty little land crabs, maybe 4 inches across, were everywhere, quickly scurrying out of our way as we approached. We entered the water here, and as we approached the point, the current took over. Spread-eagled, we were carried around the point over some beautiful coral covered rocks with sea fans and colorful soft corals. Once we cleared the point, the current subsided. There was a deep channel here (maybe 15-20 feet deep) leading into a marina further down the shore. Dead coral slabs were scattered along the bottom of the channel and a rock jetty extended about 50 feet from shore - a shellers paradise. Underneath the coral slabs, quietly sharing space with Moray Eels, were an assortment of lucky finds. Conrad was the first to surface triumphantly with a live Tritons Trumpet (Charonia tritonis variegata). He was ecstatic! And it just kept getting better. On the top of the coral and rock rubble we found Flame Helmets (Cassis flammea), Kings Helmets (Cassis tuberosa) as well as Queen Conchs (Strombus gigas). One member of our party from Ohio found a crabbed Queens Helmet (Cassis madagascarensis) - a rather unusual find. We also found several, both live and crabbed, Scotch Bonnets (Semicassis granulata granulata). Under the coral slabs were the large Measled Cowries (Cypraea zebra) as well as the smaller Atlantic Gray Cowrie (Cypraea cinera). On the cove side of the Cape it was shallower snorkeling. Here in the pure sand were the Spotted Marginella (Prunum guttatum). In the turtle grass were beautiful little Hawk-wing Conchs (Strombus raninus). Juvenile Strombus gigas were everywhere by the hundreds. As the tide dropped, we explored the exposed rocks and found the Gold-mouthed Triton (Cymatium nicobaricum) and an Atlantic Yellow Cowrie (Cypraea acicularis). Everyone was amazed at the serpentine like Brittle Starfish, which were abundant under the rocks. Walking back up the beach to the cars, we found some Gaudy Asaphis (Asaphis deflorata) - those many hued bivalves in lovely shades of blues, pinks and yellows. What a day this had been  one not soon to be forgotten. Our spider was still there when we left. At the far southern end of Eleuthera, basking on the sun drenched eastern shore along Exuma Sound, lies the picture post card beauty of Millars Beach. This was, without a doubt, my second favorite shelling spot of the entire trip - a magnificent crescent of white sand beach extending along the gently curving shore. Just offshore, and paralleling the beach, was a rocky reef covered with both yellow and purple sea fans and multihued soft corals. Brightly colored tropical fish abounded in this undersea fantasy. This was truly beautiful snorkeling - we just had to be careful of the Fire Coral, which was quite abundant. Just beyond the reef, the water was a little deeper and strewn with coral slabs. Though the shells were not as large and spectacular as at Cape Eleuthera, we did enjoy some really nice finds. On the sea fans we found many of the Flamingo Tongue (Cyphoma gibbosum). These one and a half inch shells are a spectacular sight sitting on the purple sea fans, their shells half covered with the animals lovely spotted mantle. I usually do not take these shells, but on this occasion I did take two rather large specimens. Both the Caribbean Coral Shell (Coralliophila caribaea) and the Short Coral Shell (Coralliophila abbreviata) were well represented on the holdfasts of the sea fans. Under the coral slabs, that lay beyond the fringing shore line reef, we found cones. The Mouse Cone (Conus mus), the Regal Cone (Conus regius), the Yellow Cone (Conus flavescens) and the small little Jasper Cone (Conus jaspideus). There were also a couple more of the small cowries, Cypraea acicularis and Cypraea cinerea. Another lovely find under the rocks was the Barbados Miter (Mitra barbadensis) of which I found three. Another unusual find was a "dead taken to be sure", but in great shape tiny little Rose Murex (Muricopsis roseus). At the low tide hour Jim stopped by some smooth shoreline rocks that in the past had yielded the Maiden Miter (Vexillum puella). Unfortunately this visit was disappointing. He found only two of the tiny little black miters. That evening he generously gave me one of them. I might add at this point that Jim and Bobbi were most generous in sharing their finds with the rest of us that were not as accomplished shellers as themselves. When Bobbi returned, she had two Coffee Bean Trivias (Pusula pediculus) and an Ornate Scallop (Chlamys ornata) as well as the species already listed. She also found, but, as fate would have it, lost a Giant Atlantic Pyram (Pryamidella dolabrata). It seems the lid of her collecting bottle came off, and her treasure washed out. Conrad latter found the lid washed up on the beach. The good news is that, miracle of miracles, she found another one just before we left for the day. I was taken with the trivias and Bobbi suggested I try the drift line as she said they are often found washed up there. Bobbi was right! In the twenty minutes I spent searching the drift line I found two good ones, along with a False Cup and Saucer (Cheilea equestris), several good Barbados Key Hole Limpets (Fissurella barbadensis), a large Flame Scallop (Ctenoides scaber) and a Chlamys ornata, both complete with both valves. When Jim returned he had a beautiful collection of cones and miters and a live little gem of an Antillean Scallop (Lyropecten antillarium). What a marvelous morning this had been. Should I ever get to Eleuthera again, Millars Beach will be a must. I am anxious to try the deeper reef that Conrad found around the point. I am sure it will be there. Conrad reports that it is well guarded by some very large Barracuda. On our last day of shelling on Eleuthera, Jim wanted to try a special place on the ocean side that he knew produced the elusive R. Tucker Abbotts Cone (Conus abbotti). These are always very special shells. There was a catch, however. To get to this "special place" one had to walk along the beach for almost two miles from the closest access point. This means lugging all ones equipment the whole way while walking in soft beach sand. Once there, the water is usually somewhat rough with a varying degree of current and, with the tides running the way they were, probably over ones head. Add to this that to successfully work this area required the turning over, and then back again, of many large rocks. And then there was the matter of walking all the way back again to the access point. Jim announced that he was going to make the journey, and he welcomed any or all of the rest of us to come with him. If we did not choose to go with him, then we could drop him off at the access point and we would still have the three cars to go elsewhere with. Each of us looked at our options and then made our choices. For me it was a difficult choice as I really wanted to hopefully find a Conus abbotti, but on the other hand, there was the question of whether I was physically up to such a strenuous challenge. At the final vote all of us, each for their own reason, decided not to join the search for the treasured cone. Jim would have them all to himself. Bobbi asked if we would like to drive a couple of hours north and make a sightseeing journey of the northern part of the island, maybe find a couple of gift shops for the ladies and then snorkel at a couple of locations on the way back. We all thought that sounded like a good idea. We drove north, past the area we had snorkeled just days before. Soon we came to Hatchet Bay, a delightful spot with its very picturesque harbor. In Gregory Town we spotted a couple of quaint local gift shops which we promised to visit on the return trip. Finally we reached a spectacular place called The Glass Windows Bridge. 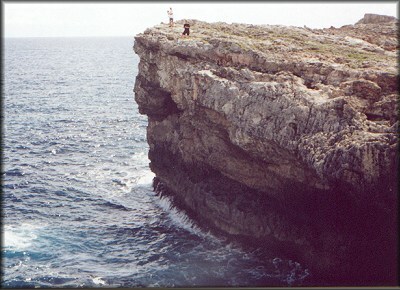 This is the narrowest point in all of Eleuthera. On the ocean side were huge cliffs with a rough and rolling ocean below. On the other side of the bridge the water was calm and tranquil as it could be. Photo opportunities abounded here and the raw natural beauty of this place captivated us. At one time the bridge was a natural one, but some years ago the sea took out the natural bridge and so a new man made one was constructed. The calm side looked like a great place to snorkel, however access was steep and rocky. We opted to find a more suitable place on the drive back home. If I ever get back to this place though, I would like to try shelling there. On the way back we snorkeled at just south of Hatchet Bay, also at Rainbow Bay not far from Governors Harbor and again at Savannah Sound. At the pre appointed hour of 4:00 PM we went to meet Jim as he returned from his quest for the Conus abbotti. Unfortunately it had been a rather disappointing seven hours for Jim. He had found only six or seven of the elusive cones. They were beautiful cones to be sure and a couple of them were quite large. Jim described these larger 40 mm. specimens as typical females of the species, while the smaller darker ones were the males. He had also uncovered a quite large and perfect live Cypraea zebra, the first one he had found at this location. Although this was not very many shells for the time and work spent, they were outstanding specimens. I was impressed. Next time I will probable join Jim on his quest once again for this elusive and endemic (to the Bahamas) little cone. All too soon it was time to leave Eleuthera. As the plane took off, we went out over the ocean, banked right and flew right back over Cape Eleuthera. We looked down at the very point around which Conrad had found his Triton Trumpet, at the lovely beach where we had found the Hawk Wing Conchs, at the place where we had found those lovely Cypraea zebra and all those hundreds of juvenile Queen Conchs. Over the roar of the planes engines I was sure I could hear this magical cape, my favorite spot on all of Eleuthera, whispering "Remember me always, I shall be here waiting when again you return". And return I shall -- then once again, I can "Make Mine Eleuthera!"